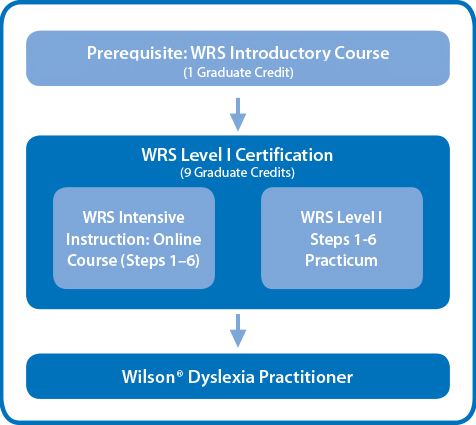 The Wilson Reading System® (WRS) Level I Certification program is designed to prepare teachers to effectively implement WRS Steps 1-6 with students who are reading and spelling below grade level, as well as those diagnosed with a language-based learning disability, such as dyslexia. It consists of two components: the WRS Intensive Instruction for the Non-Responsive Reader (Steps 1-6) online course and the WRS Steps 1-6 Practicum with companion online course. A critical factor for student success is teacher knowledge and skills, and the ability to apply those in the classroom with students. The WRS Level I Certification Program provides a course that deepens teachers’ content knowledge while providing a supervised practicum that allows teachers to apply and practice skillful use of research-based strategies. Considerable time, effort, and study are required for the WRS Certification program. Each trainee is expected to acquire a very sophisticated working knowledge of the sound-symbol system of English (phonology), the rules that govern English spellings (orthography), and its structure (morphology), as well as the use of specific diagnostic techniques in teaching decoding and encoding, and strategies for vocabulary, fluency, and comprehension. WRS Introductory Course (completed within the last five years). Individuals have 12 months from the date of enrollment to complete the online course and practicum. If site-based, participants are encouraged to complete certification within the school year. Certification Communities are offered at various locations across the country dependent on trainer availability. Web-Based Practicum is appropriate for tech-savvy participants who may not have a Certification Community in their area. Schools and districts considering or currently implementing the Wilson Reading System may be interested in certifying a group of their educators. Contact us to explore development of a COMPASS Plan (Comprehensive Plan for Achieving Success and Sustainability). Complete a comprehensive online course: WRS Intensive Instruction for the Non-Responsive Reader (Steps 1-6). Conduct 1:1 WRS instruction with a practicum student for a minimum of 65 lessons with a lesson plan written for each lesson. Student must meet selection criteria and be approved by the assigned Wilson® Credentialed Trainer. Be observed five times teaching the practicum student. Each observation is scheduled with the Wilson® Credentialed Trainer and lasts approximately 60-75 minutes. Develop a Teacher Binder and Student Portfolio and compile student’s written work in accordance with WLT program standards. Demonstrate mastery of the WRS Lesson Plan procedures (documented and approved by Wilson® Credentialed Trainer). Demonstrate an understanding of language concepts through accurate teaching with multisensory procedures. Demonstrate student mastery of reading, spelling, fluency, and comprehension. Conduct pre- and posttesting with two norm-referenced tests, one being the Word Identification and Spelling Test (WIST), and submit posttest data with practicum student final report after a minimum of 65 lessons and achievement of WRS Substep 4.2. The practicum student must meet the following criteria and be approved by Wilson Language Training before instruction begins. In or entering grades 4-12 (grade 3 approved if student has been retained). Overall cognitive ability in average range (minimum IQ = 80). Overall reading must be ranked in the 5th to 30th percentile with a minimum total reading score of grade 2.0. Student’s listening comprehension ability is higher than independent reading comprehension. Student has poor decoding and spelling skills. Student must be available to be scheduled for a minimum of three to four 45-minute lessons or two to three 60-90 minute lessons per week (1:1). The practicum student must not have any previous Wilson instruction. Whether the criteria is met should be determined from school records and current testing. Testing results used to select practicum student must be no more than six months old. A similar individualized reading assessment may be substituted if it provides information regarding decoding, comprehension, and total reading. Prior approval from Wilson Language Training is required. WRS Introductory Set (Steps 1-6), 4th edition, containing instructor and student materials. WIST (Word Identification and Spelling Test) for student testing. For individuals registering for WRS Level I Certification (through a Certification Community, including when enrolling in a web-based practicum course), materials may be ordered at the time of registration. For school and district implementation, materials information will be provided as part of the COMPASS Plan. Effectively utilize multisensory structured language (MSL) instructional techniques, and demonstrate explicit teaching, modeling, guided practice, and consistent review in lessons. Understand language processes and how they impact the development of proficient readers and writers: phonological, orthographic, semantic, syntactic, and discourse. Successfully incorporate the following areas of reading instruction during WRS lessons: phonemic awareness, phonics, word structure, fluency, vocabulary, and comprehension. Accurately teach the structure of the English language (presented in WRS Steps 1-6): consonant and vowel phonemes, syllable structure, common orthographic rules and spelling patterns, common Latin-base elements and affixes, etc. Identify printed words that do not follow the rules of English, and incorporate multisensory structured language techniques to help students learn how to correctly read and spell these words. These words include high frequency words. Diagnostically plan and deliver lessons, addressing and understanding specific student weaknesses that impact the ability to learn to read and write. Appropriately pace students through the curriculum, developing mastery of material taught, designing lessons that focus on accuracy, automaticity of word reading, and fluency with text reading. Develop students’ listening and reading comprehension skills through the Wilson Comprehension S.O.S.™ process. Model and incorporate reflective awareness and visualization strategies in order for students to develop a coherent mental model of text. Develop students’ fluency skills by modeling and practicing a penciling technique to encourage proper phrasing and prosody. Administer pre- and posttesting assessments to document student growth in word attack, spelling, comprehension, reading fluency, and broad reading measures. Participants completing this certification program may represent themselves as WRS Level I Certified Teachers, but are not qualified as Wilson® Credentialed Trainers. Wilson Level I Certificate holders earn the recognition of Wilson® Dyslexia Practitioner (W.D.P.) and must re-credential every five years to maintain the W.D.P. recognition. Up to nine graduate credits (optional) are available through Fitchburg State University, Fitchburg, MA, upon completion of course requirements. Please see Process for Graduate Credit for details.